Once your initiative is created you can finalize the set up in the initiative settings. In the Campaign Tagging section, you define what Facebook campaigns you want to tag with URL Parameters. Tag all campaigns – This will generate URL Parameters for all campaigns in the account regardless if they are active or inactive. Tag specific campaigns I choose – With this setting you can select particular campaigns to tag. Picking individual campaigns is a manual option and limits the automation. Tag campaigns that meet criteria – The criteria feature allows you to apply dynamic filters to your Facebook ad account. By using a dynamic filter any Facebook campaigns existing, paused, active, new or campaigns yet to be created in the future that fall within the filter will automatically get tagged by EAT with respective URL Parameters. Campaign Name Does Not Contain – More often than not accounts follow the same parameter structure, but at times there are unique instances where you would need to deviate from the standard naming convention. If this is the case, you can tag all campaigns in a Facebook ad account except the ones with a unique parameter value using this filter. Campaign Status Is – The Campaign Status Is filter looks at the active or paused Facebook campaigns. Note: Keep in mind that this is a dynamic filter and it will look for active and inactive campaigns on an ongoing basis. Campaign Created Before & Campaign Created After – The Campaign Created Before & Campaign Created After filter applies to campaigns created before or after a specific date. You also can add a future date here. This filter is useful for existing accounts with active campaigns so that current parameters are not affected when implementing EAT. 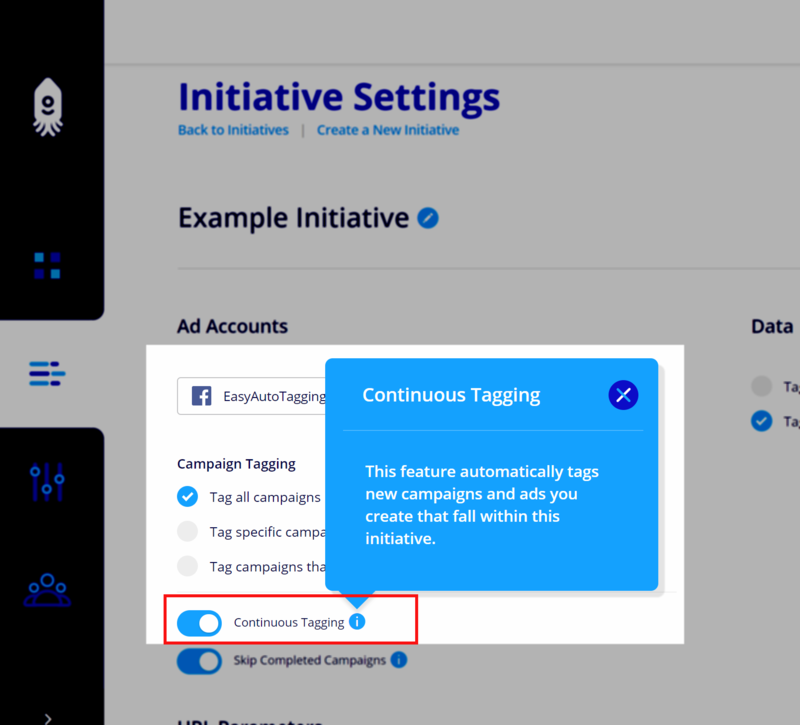 Continuous Tagging – With continuous tagging active EAT checks your Facebook account on an ongoing basis for any new campaigns that fall within a given filter, and it detects any dynamic value changes, i.e., Campaign Name and updates UTM Parameters respectively. 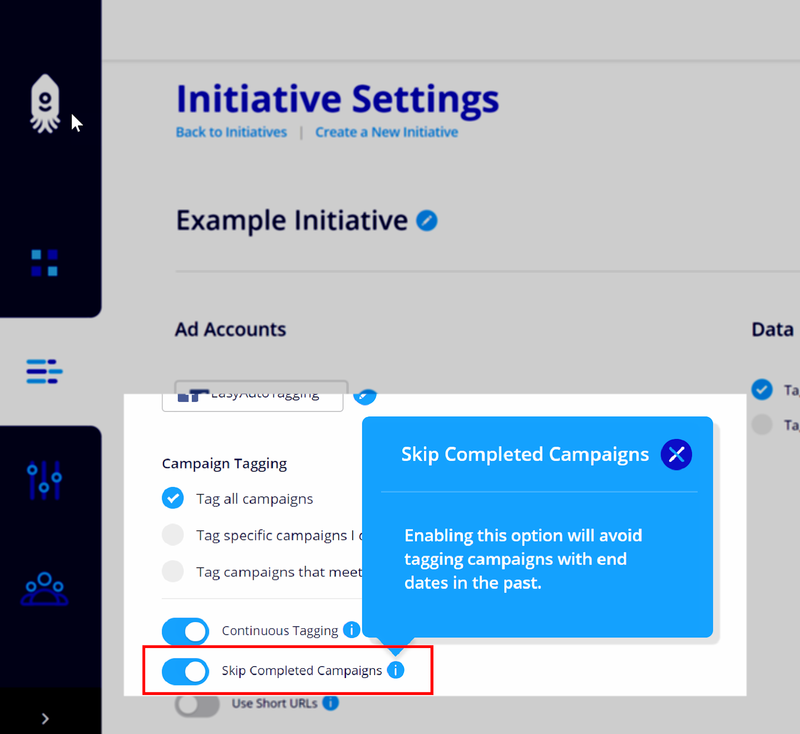 Skip Completed Campaigns – If Skip Completed Campaigns is toggled on (default) EAT will not tag any campaigns labeled by Facebook as completed (meaning they are not set to ongoing and have a defined end date) with URL Parameters. Note: Keep in mind that campaigns that are turned off without an end data do not fall under this category because Facebook labels these as inactive not completed.